Luljeta Lleshanaku was born in Elbasan, Albania. She grew up under house arrest during Enver Hoxha’s Stalinist regime. Lleshanaku has worked as a lecturer, literary magazine editor, journalist, and screenwriter, and is currently the research director at Tirana’s Institute of Studies of Communist Genocide. She is the author of eight poetry collections published in Albania. Her books have received many national and international awards and have been translated into several languages. 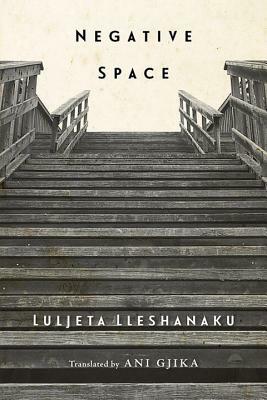 “Language arrived fragmentary / split in syllables / spasmodic / like code in times of war,” writes Luljeta Lleshanaku in the title poem to her powerful new collection Negative Space. In these lines, personal biography disperses into the history of an entire generation that grew up under the oppressive dictatorship of the poet’s native Albania. For Lleshanaku, the “unsaid, gestures” make up the negative space that “gives form to the woods / and to the mad woman— the silhouette of goddess Athena / wearing a pair of flip-flops / and an owl atop her shoulder.” It is the negative space “that sketched my onomatopoeic profile / of body and shadow in an accidental encounter.” Lleshanaku instills ordinary objects and places—gloves, used books, acupuncture needles, small-town train stations—with subtle humor and profound insight, much as a child might discover a world in a grain of sand.